Within the Webinos project we have investigated if we could use XMPP as the signalling protocol. Although it was decided by the Webinos project not to use XMPP in Webinos we believe we’ve made some interesting observations and solutions for some of the problems we’ve encountered in our investigation. We presented our findings in the Jabber dev-room on FOSDEM’13 and got some interesting feedback from the Guru’s present. 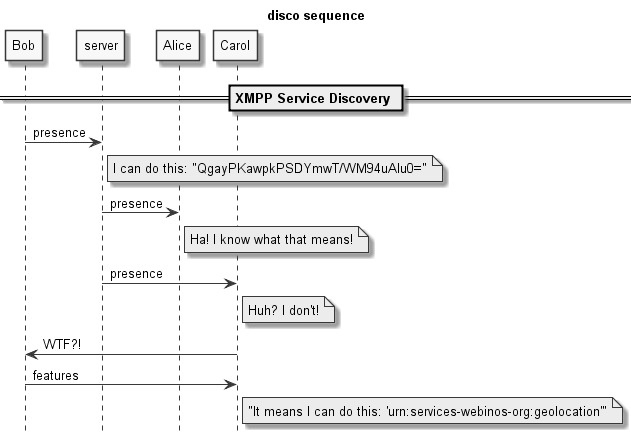 In this blogpost we want to share our insights upon service discovery and invocation in XMPP which we believe are very well applicable onto machine-to-machine communications and the Internet-of-Things. If you would like to know what Webinos is all about I suggest that you watch this short film that describes Webinos quite well. But to summarize: Webinos is about sharing device capabilities with applications running of different devices. For instance one can have an application running on a thermostat at home that uses the GPS capabilities of a car to track if your home should be heated or not. One of the requirements is that a device can have multiple instances of the same capability, for example a smartphone has an internal GPS sensor but can also pair with a Bluetooth GPS sensor that has better accuracy, hence the GPS service would have 2 instances on this device. Bob publishes his presence state to the server and the server propagates his presence state to all his subscribers. Encoded in his presence message is a hash based upon his device capabilities, it is unique for every state, so if a capability gets added or removed the hash will change. If a receiving node does not know what the hash means, that node can ask Bob’s device for more information. The receiving node can that cache that information using the hash it received earlier. Note that all of Bob’s own devices are also subscribed on his presence so each of his devices will receive the presence updates of his other devices. We added an instance element to each of the feature elements. The instance element holds the identifier for each service instance and hold some additional information about the service. The additional information can be extended with extra information about the service, like for example the accuracy of the GPS device. Because someone’s TV is now aware of the location services on someone’s mobile it can now choose which of these service instances it want to invoke. Since webinos is all about web technologies we’ve chosen not to use XMPP RPC (XEP-0009) but to transport JSON RPC payloads over XMPP. As mentioned above we’ve presented our idea in the Jabber dev-room on FOSDEM. The initial feedback we got from the XMPP Guru’s that were in the room was that XMPP Service Discovery disco#info feature we extended is about getting information about what exactly a node is capable of. One could than use disco#items to discover the instances of the feature. Someone’s mobile has one location service available. It has an accuracy of 30 meters. To notify other devices about this feature is sends out a presence update with version hash 123. Someone’s TV gets the details that belong to version hash 123 and uses disco#items to query for the instances of the location services. The single service that is present is not accurate enough for someone’s TV as the application that is running there needs an accuracy of 10 meters. Someone pairs a Bluetooth GPS device with an accuracy of 10 meters with his mobile. The disco#items of someone’s mobile change but the feature list stays the same, so the version hash will stay 123 and the presence state would not have to updated. Someone’s TV would never be aware of the fact that his service requirements are now met because someone’s mobile feature set is still the same. The approach we’ve chosen for service discovery proved to work quite well with our requirements but XMPP flexibility makes other solutions to the same problem viable as well. This entry was posted in domotica, internet of things, machine to machine, Networking, programming, protocols, telecommunications and tagged rpc, service discovery, webinos, xmpp. Bookmark the permalink.